I recently had the pleasure of giving a short talk at one of my favorite local Meetups: AnalyzeBoulder. If you have the chance, this group of folks is a lot of fun to interact with. 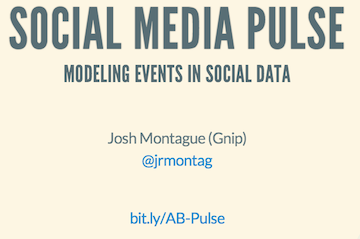 My talk was a short introduction to the space of social data, the importance of focusing on a single event in a "firehose" of realtime data, and a brief intro of the Social Media Pulse (SMP). The SMP is a model we have used to describe the data shared by e.g. Twitter users following an unprecedented and unexpected event like an earthquake. The slides are available online, here.